Seven-hundred-thirty-one million people in China are on the Internet, and half of them, a population equal to the United States, are there to watch others live stream video of themselves. The content varies from pole dancing to online classes. It's all part of an industry worth $3 billion. NPR's Rob Schmitz brings us this profile of one of China's unlikely Internet celebrities. ROB SCHMITZ, BYLINE: It's early afternoon, and the roosters of tiny Three Stones Village are clucking themselves into a frenzy. 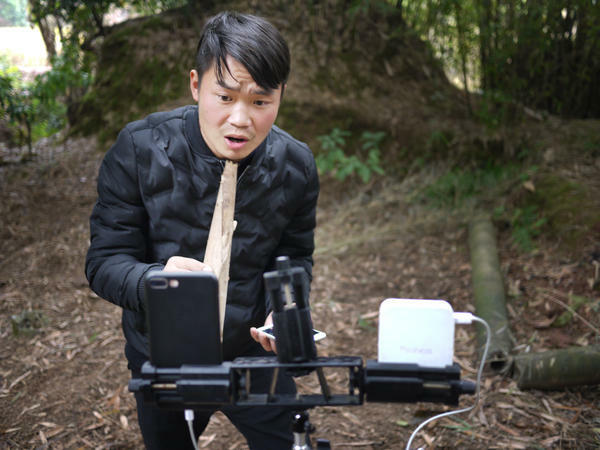 SCHMITZ: They're responding to the antics of farmer Liu Jin Yin, who I'm following as he darts this way and that between bamboo groves and rice paddies, carrying a tripod that holds his iPhone. LIU JIN YIN: (Foreign language spoken). SCHMITZ: I just picked some medicinal flowers, he says, jumping down from a tree with a bouquet. His phone lights up with messages and tiny flower and beer emojis, each representing an online donation from his nearly 200,000 subscribers who tune in each day to watch him narrate his life as a farmer. The wiry 26-year-old makes the equivalent of $1,500 a month doing this, more than anyone makes in his village. He's one of thousands of Internet celebrities watched by more than 344 million regular viewers. JEREMY GOLDKORN: It's very difficult to get entertaining entertainment in China. SCHMITZ: Jeremy Goldkorn is editor-in-chief of China news site SupChina. GOLDKORN: The movies that are shown in the theaters and the stuff that is permitted on the Internet are all highly censored and, as a result, highly predictable. SCHMITZ: And that's why revenue for the more spontaneous live streaming in China has more than doubled in size in the past year. SCHMITZ: And that's meant that after years of working in faraway factories, farmer Liu can make more money back on the farm with his family. In the process, he's learned a few things, like how to read. Liu dropped out of school in the fifth grade. LIU: (Through interpreter) I had trouble reading messages from my fans when I first started, but I've made progress. This has changed me. SCHMITZ: Liu has even met his current girlfriend from his live streams. SCHMITZ: The two walk along a narrow path to an orange tree. 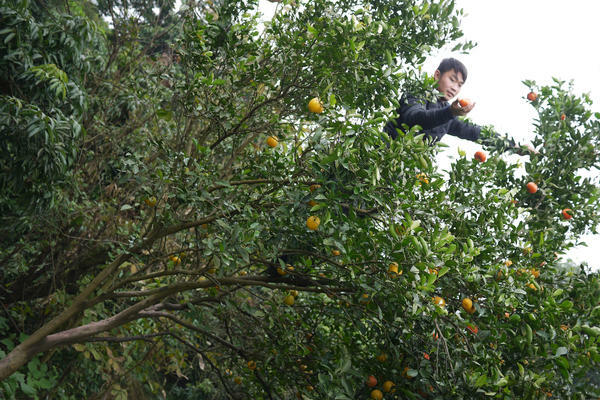 SCHMITZ: "Brothers and sisters," he says while picking an orange, "here, have one - my treat - no, no pesticide on these. Thanks for your gifts." 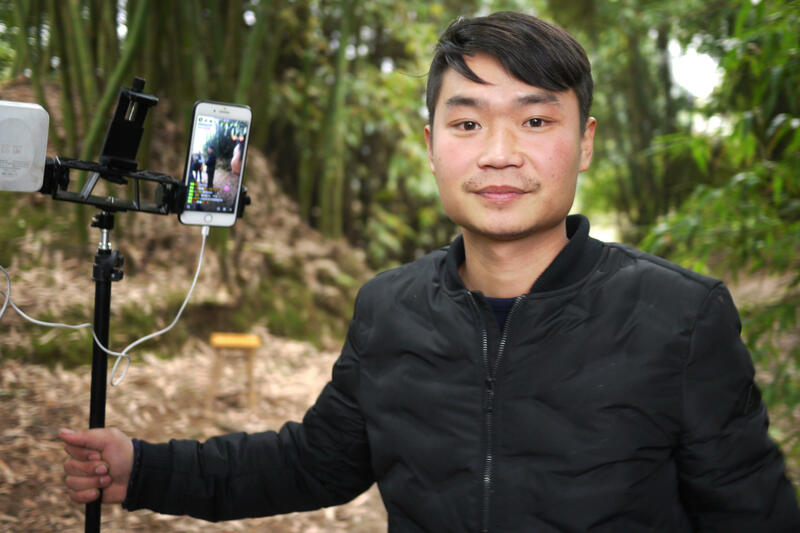 Liu typically begins his day live streaming his morning chores - picking weeds, feeding pigs and cleaning up their pens - while talking into his phone the entire time. LIU: (Through interpreter) When I started live streaming, my neighbor saw me talking to myself and thought I had become a lunatic. SCHMITZ: But after the money started rolling in, says Liu, they stopped thinking that. He says his online popularity is less about entertainment, though, than it is about nostalgia among China's fast growing urban middle class. LIU: (Through interpreter) A lot of people who live in urban China grew up in the countryside. They miss life on the farm and the fun they had when they were kids. My most popular moments are when I live stream myself playing with an iron hoop or catching eels and crabs in the rice paddies. SCHMITZ: And as it turns out, this is a popular moment for Liu, too, the moment when I, a foreign journalist, arrive to interview him. He live streams our entire interview. A couple of viewers requests that Liu and I sing an English song together. Sensing a business opportunity, Liu fires up a karaoke app on another phone and bullies me into singing a Chinese karaoke classic. As I've done for years in China, I reluctantly comply. And suddenly, it's "Yesterday Once More." LIU: (Singing in foreign language). SCHMITZ: Beer, flowers and other emojis from fans fill Liu's phone. And by the end of the song, he's made $50. Rob Schmitz, NPR News, Three Stones Village, Sichuan. (SOUNDBITE OF CLAUDIO CORSI SONG, "YESTERDAY ONCE MORE") Transcript provided by NPR, Copyright NPR.